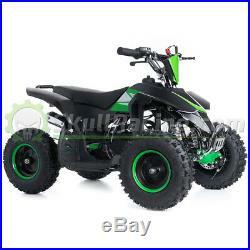 SkullRacing Mini ATV 50RR (Green). The 2019 Mini ATV 50RR is designed for maximum fun to the youth ATV class for riders 6 and up, with a low-maintenance 49cc engine tuned to develop excellent low-to-mid range performance. With an emphasis on safety and adult control, this Quad features a throttle limiter to control engine output, a tether switch to shut off the ignition, and a keyed main switch that prevents unauthorized use. The 2019 Mini ATV 50RR is engineered as the ideal starting point for aspiring ATV riders aged 6 and up, with a low-maintenance 49cc engine tuned to develop responsive, controllable performance. A combination of engine limiters and a power cut-off tether switch make it easy to allow young riders to adapt to the ATV as their skills grow. A robust steel frame design and single A-arm front suspension is tuned for light, easy steering and comfortable ride quality. The rear swingarm also features a compact single shock for good control and comfort. It also boasts convenient features like a fully automatic continuously variable transmission (CVT) means no shifting. Handy for all riders, its a feature entry-level riders particularly appreciate. Adjustable hand controls, full floorboards, and a low seat height make sure that beginning riders will enjoy active convenience and control. For parents, the throttle is simple to govern, to keep children at speeds that compliment their skill level. To sum it up, the ATV-50RR is packed with quality, safety, and style, making it the perfect choice for younger adventurers! International Orders: Outside of U. Our mission is to provide you with the best products and the best service in the industry. We understand that sometimes, customers change their minds about products that they order or simply do not need them anymore. We also know that customers are cautious about Return Policies since they are often tricky and misleading. For orders placed during the holiday season from November 15th to December 31st, the return period is extended to 30 days. The following rules apply: Products must be in original packaging and in a new and resalable condition. Any product that was used or fully/partially installed is non-returnable. There are few non-returnable products & services that may be offered on our website. Please allow 24 to 72 hours for processing your claim. DEFECTIVE, DAMAGED, OR INCORRECT PRODUCTS We all know that accidents happen sometimes. If your product(s) will arrive defective, damaged, or simply incorrect, please contact our customer service department as soon as possible. Please do not attempt to use or install the part! ORDER CANCELLATIONS When you request a cancellation of an order or a part it may take up to 72 hours to process your cancellation claim. Please allow an additional 5-7 days for the credit to appear on your account. SkullRacing Mini Dirt Bike 50RR (Blue). SkullRacing Mini Dirt Bike 50RR (Green). 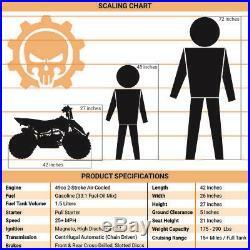 SkullRacing Mini Dirt Bike 50RR (Orange). SkullRacing Mini Pocket Bike 50RR (White). The item "SkullRacing Gas Powered Kids Mini ATV Four Wheeler 50RR (Green)" is in sale since Saturday, December 8, 2018. This item is in the category "Toys & Hobbies\Outdoor Toys & Structures\Ride-Ons & Tricycles\1970-Now". 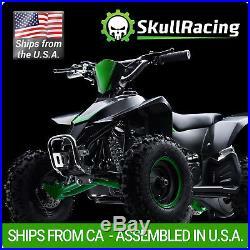 The seller is "skullracing" and is located in La Verne, California. This item can be shipped worldwide.